The Pennsylvania Supreme Court named senior judge Stephen McEwen as the chair of the Legislative Reapportionment Committee. McEwen has served as the Delaware County District Attorney. 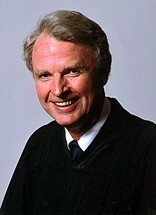 In 1981, he was elected to the Superior Court where he served until retirement in 2002. “Judge McEwen’s reputation is solid and his long tenure on the Superior Court was excellent preparation for this special task, which requires knowledge of the entire state and its many regions,” said House Democratic Leader Frank Dermody. “I expect him to be a fair arbiter as the commission proceeds to do its work. “Redistricting is a process of making choices in the interest of fairness. The natural role of a judge is to be even-handed and judicious. I believe Judge McEwen has the temperament to handle this critically important task very well,” Dermody said. The Legislative Reapportionment Committee is presented with the task of examining issues regarding redistricting. The LRC examines issues in past reapportionment cycles. It is also tasked with the determining how past redistricting has affected individuals or organizations. The LRC consists of the House and Senate Minority and Majority Leaders as well as fifth member upon which both were supposed to agree. Since the four caucuses could not come to an agreement, the Supreme Court gets involved and selects the fifth member. Though all four caucus leaders had kind words for McEwen, his selection demonstrates the strong political realities of the process. The PA Supreme Court, comprising 5 Republicans and 4 Democrats, has the final say in any redistricting dispute. McEwen himself is a Republican. In this year’s redistricting, the buck stops with the GOP.